Thunderstorms. A few storms may be severe. High 72F. Winds SSW at 10 to 20 mph. Chance of rain 90%..
Showers in the evening, then partly cloudy overnight. Low 47F. Winds WNW at 10 to 15 mph. Chance of rain 50%. 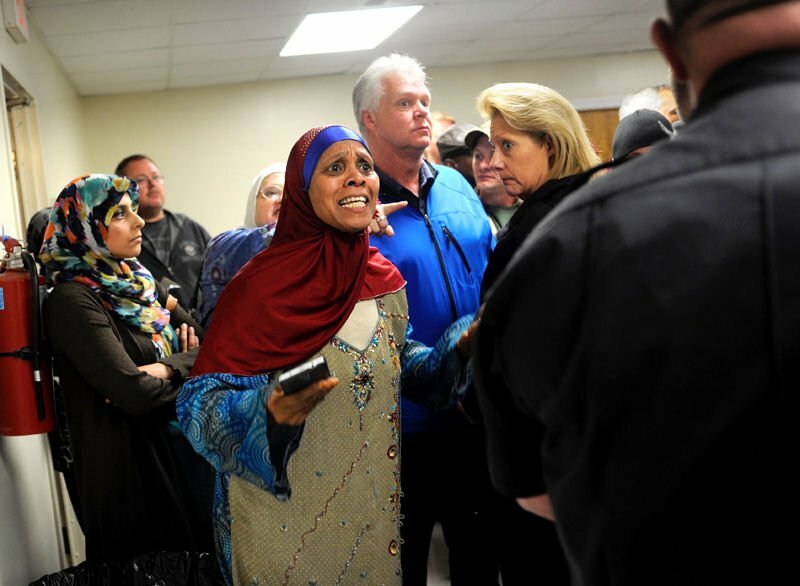 Sister Munira Salim Abdalla, chief administrator for the Islamic Umma of Fredericksburg, asks a law enforcement official to intervene after hearing someone say they were threatening Islam during a heated public meeting regarding the possible construction of a new Islamic Center of Fredericksburg site at the corner of Andora Drive and Old Plank Road takes place at the Chancellor Community Center in Spotsylvania County on Tuesday, Nov. 17, 2015. 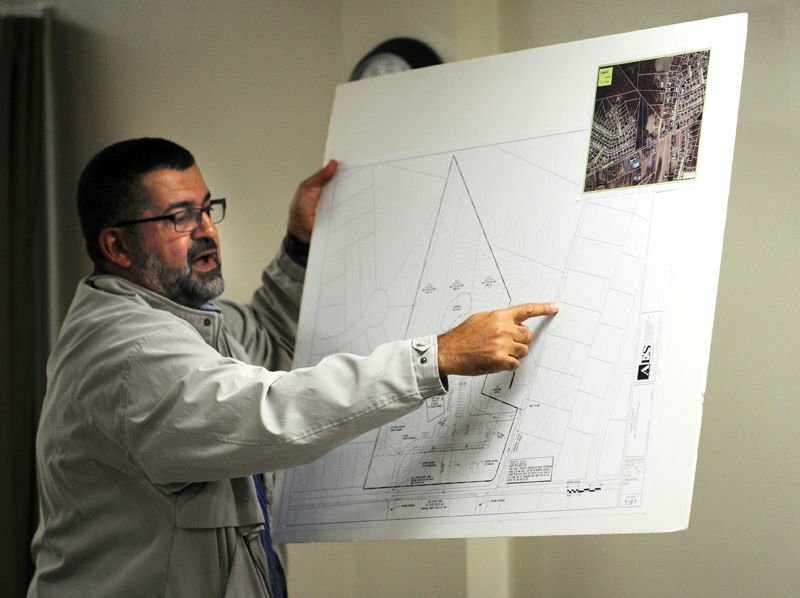 Samer Shalaby, member of the Islamic Center of Fredericksburg's board of trustees, shows plans of the organization's proposed new site during a public meeting at the Chancellor Community Center in Spotsylvania County on Tuesday, Nov. 17, 2015. Shalaby then started a presentation on the Islamic Center’s plan to build an 8,000-square-foot mosque at the corner of Old Plank Road and Andora Drive. The mosque would move there from its current location on Harrison Road, across State Route 3 from Harrison Crossing. Some people in the packed room at the Chancellor Community Center—including opponents of the project—expressed disagreement, while others clapped. “How do you come up with that?” Shalaby replied. Shortly thereafter, a uniformed sheriff’s deputy in attendance said he would stop the meeting “if this gets to a violent point.” He noted that he was greatly outnumbered. “Can we at least please keep it civil for me and my wife and my three children?” the deputy said. Supervisor Timothy McLaughlin, whose Chancellor District includes the proposed mosque site next to the Ashleigh Park subdivision, asked the crowd to let Shalaby give his presentation before posing questions. That didn’t happen, and the tension continued to escalate—with shouting matches and expletives—until the deputy waved his arms and called off the meeting. “Listen to me, it’s done,” the deputy said. The attendees complied with his order to exit the building. He said the Islamic Center has been in the Fredericksburg area for nearly three decades and at its current location since 2000. “We’re all Americans first,” she said. Several attendees attempted to steer the discussion to less emotionally charged issues such as the traffic the project would generate. McLaughlin also said traffic was the main issue. “The roads here cannot handle a commercial facility,” he said. The mosque would have 200 parking spaces and an entrance on Andora Drive, Shalaby said. The lack of parking at the existing facility is why the Islamic Center’s trustees want to move to the 10-acre site, which they purchased in 2012 for $250,000. Shalaby said the country guarantees freedom of religion, but another man said that doesn’t give him the right to build a mosque wherever he pleases. The mosque must receive a special-use permit, which requires at least two public hearings—first in front of the Planning Commission, then the Board of Supervisors. The Planning Commission will make a recommendation to the supervisors, who have the final vote. No hearings have been scheduled, because the mosque trustees have not submitted a formal proposal to the county. Sheriff’s Capt. Jeff Pearce said there were two plainclothes law enforcement officers at the community meeting, in addition to the uniformed deputy. And he said two other deputies were on patrol nearby. McLaughlin mentioned the possibility of having another meeting at Riverbend High School’s auditorium to accommodate more people. Some residents had to stand outside and watch Tuesday’s meeting from an open window at the Chancellor Community Center, which has a capacity of just 171 people.